Franklin Street Works (41 Franklin St) is off with a bang (and a boom, a smash and a crash). This Thursday, Nov 17th from 5-7pm, they are mixing things up with an Experimental Music Night. 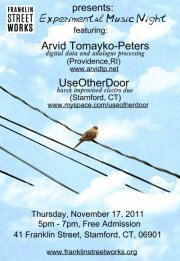 Artists featured will be Arvid Tomayko (from Rhode Island) and music duo Use Other Door (from your backyard here in Stamford). In addition to some funky beats, you'll get to see a new exhibit in the works.